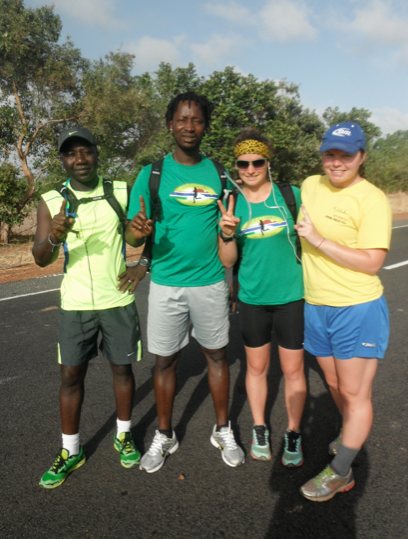 ← Day 4: 100km Done for Peer Health Education in The Gambia! Wow, the past twenty-four hours have been quite the experience, starting with our Gambian naming ceremony last night and the 27 km run today. I will start with the naming ceremony. In Gambian society, it is tradition to name your baby exactly seven days after it is born. When you name your baby, it is accompanied by a large ceremony and celebration, including music, drinks, and dancing. 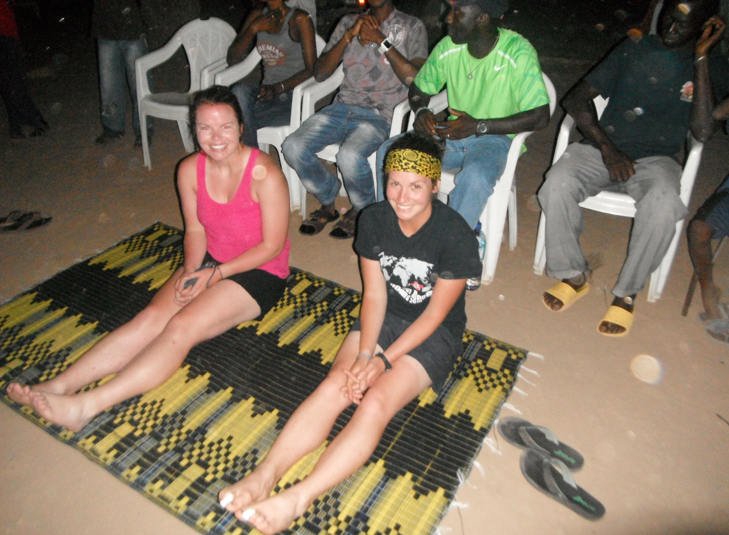 Since me and my sister have now been in The Gambia for seven days, the team decided that it should be our naming ceremony day, and they made sure that it was as authentic as possible, with no exceptions. When evening rolls around, people begin to show up. First, two NSGA teacher coordinators from Bansang Upper Basic School and nine NSGA peer educators from their school. Then the band shows up, then a bunch of people from around the hotel show up. 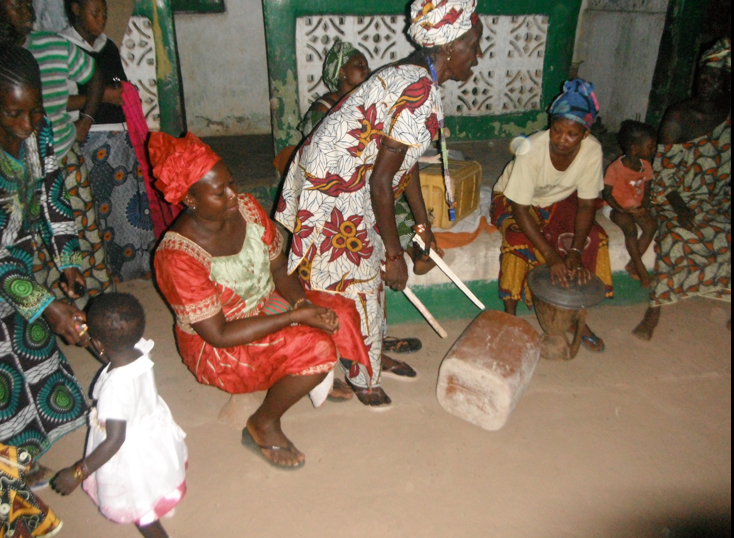 It is officially a Gambian naming ceremony and people are here to celebrate! It starts out with lots of drumming, singing, and dancing. Everyone, from the older women, to students, to the group of small children gathers and takes part. The dirt from the ground rises in a huge dust cloud as everyone stomps to the beat in a rhythmical way you can only find in Africa. It’s so neat to be apart of this. and I am to be called Jareh. They explain that they chose our Gambian names based on the names of two peer health educators in Bansang that were excited about the run and wanted to run with us tomorrow. Jareh was so excited to have a Canadian take on her name, and I also am very excited to take on a name of a Gambian peer health educator. A will go into a bit of detail about Jareh because I was able to talk to her for a while last night and learned about her and her experience as a peer health educator. Jareh is 15. She attends Bansang Upper Basic School. She is beautiful, a bit shy, and one of the boys keeps teasing her. When she grows up she wants to be a teacher or a doctor. She is smart. 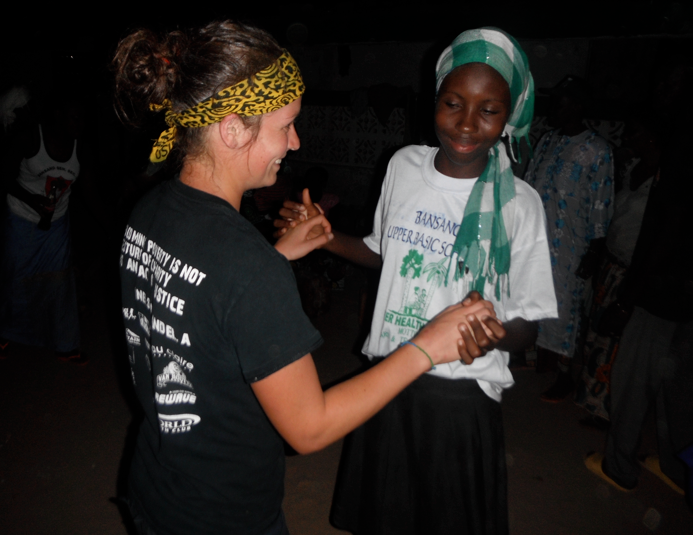 She enjoys being a peer health educator in her school because it is fun and allows her to educate and teach others. She also likes the program because it helps her to know what is safe and what is not safe. I see so much potential for Jareh and the group of peer educators that came along to celebrate with the naming ceremony. They are a bubbly, excited, and talkative group. You can tell they are all leaders in their own way, some are silly, some are talkative, some are serious. It is a neat group of 15 and 16 year olds. The student would then go on and inform the crowd about themselves. For example, one student said. “I am Madame mosquito. I like to live in wet places and I like to come out especially at night. I carry malaria and can infect you if I bite you. However, if you are under a bed net at night, I am unable to get through and I cannot bite you”. Other examples included Mister Bacteria, Madame Virus, and so forth. It was an entertaining and effective way to learn about certain diseases and some useful information about all of them. I was amazed by how animated the peer health educators were. This method of teaching really is effective and very beneficial for both the students listening to the presentation and to the peer health educators teaching the students. Seeing the presentations by the students really motivating because this run is supporting students exactly like these peer health educators and the hundreds of students that they will teach about health. Followed by, quite the day. Start to day FIVE already! At about 10km we met up again with the peer health educators that we had met last night. 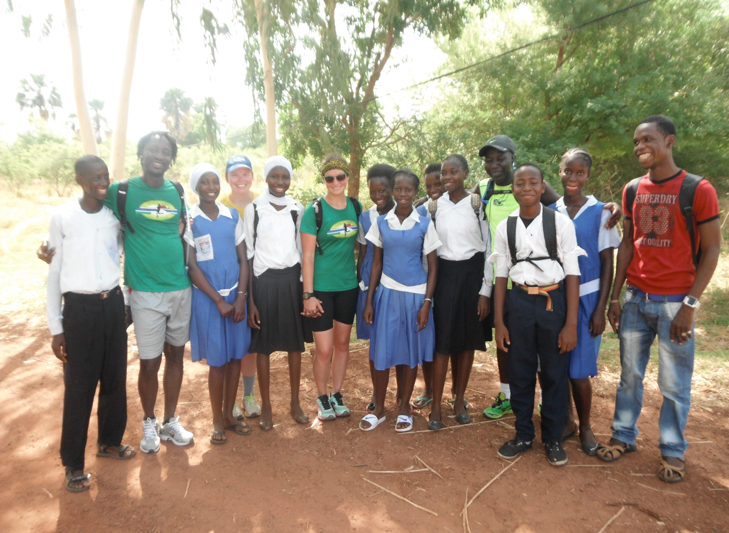 They had walked to the main road to meet us and planned to run a kilometer with us in support of Love4gambia. I found Jareh and we ran together, hand in hand for a while, until both our hand got too sweaty. All of the students were out of breath when we reached the top of the hill at the end of the kilometer. 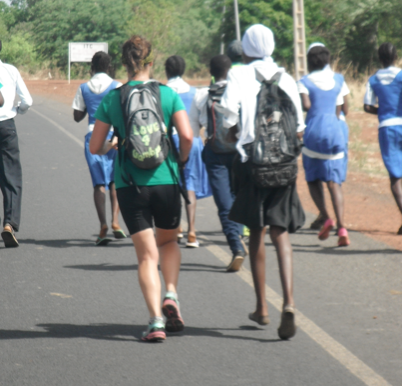 They were all ready to stop and turn around and get back to school, and I think running a kilometer with us made a lot of them realize just how long 25km per day is. After some hugs and thanks-yous, we parted ways, and continued westward on the South Bank Road. A shot with the Peer Health educators and the teacher coordinator from Bansang Upper Basic School. These guys are amazing and I’m so inspired to run for them! The next 10km passed without much ado. It was just me and Kebba running, and we were both building off of each other and ran faster and stronger until we sprinted in to the 20km mark. Then, time for a quick rest and refuel, and then we finished off with a 7km run in order to make it to the 300kilometer marker, just past the turnoff to Janjaburah, where we are spending the evening tonight. Hoping tomorrow feels as good as today did! Thanks for the read, and if you are as inspired as I am by the peer-health educators and the work the NSGA does, please consider supporting the Love4gambia 2013 run. This entry was posted in Developing Country, running and tagged Africa, Africa Running, Bansang, Gambia, motivation, Naming Ceremony, Nova Scotia-Gambia Association. Bookmark the permalink. Jareh, what a great experience for you. You are becoming more Gambian with each posting, and I’m not just referring to the darker skin tone you appear to be picking up – likely from all the dust soaking into your pores as much as the sun! It is great to read how well received NSGA’s work in the villages is, and the warm receptions at each stop. That has to be the best fuel for running each day. I’m sure it isn’t easy to sit down and write these each day, hope you appreciate how inspirational every posting has been. Sending my best for the tough days ahead, to both you, Mama Cie/Adama and the boys.